This is it, amazing friends! 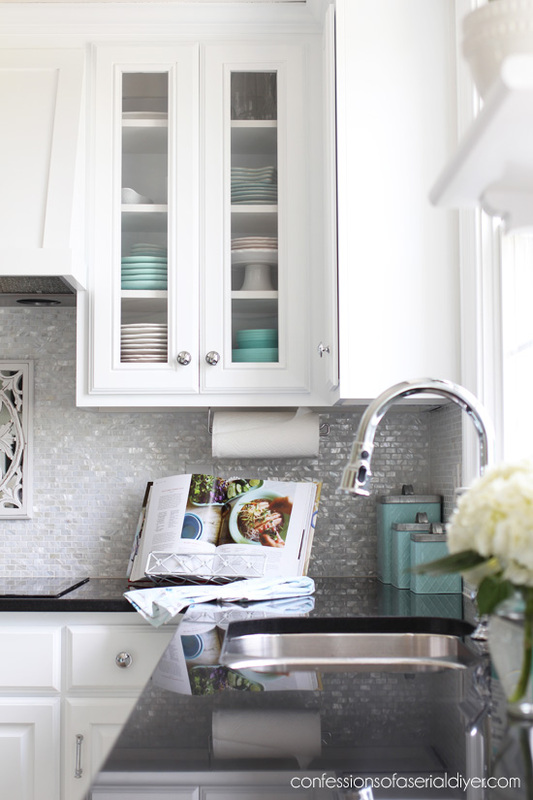 Our kitchen makeover is complete and I am SO thrilled to share it with ya’ll today! Shall we take one last peek at what it looked like before? I am so grateful we were blessed with excellent bones to begin with. But…goodbye darkness, hello light and bright, with a side of charm! I knew from the start these cabinets would be painted. I just like a lighter, more airy feel in my spaces. And almost one year to the day we closed on our house, it is finally done! It is like a breath of fresh air! The first thing I did was get rid of those dark cabinets with a whole lotta primer and paint. 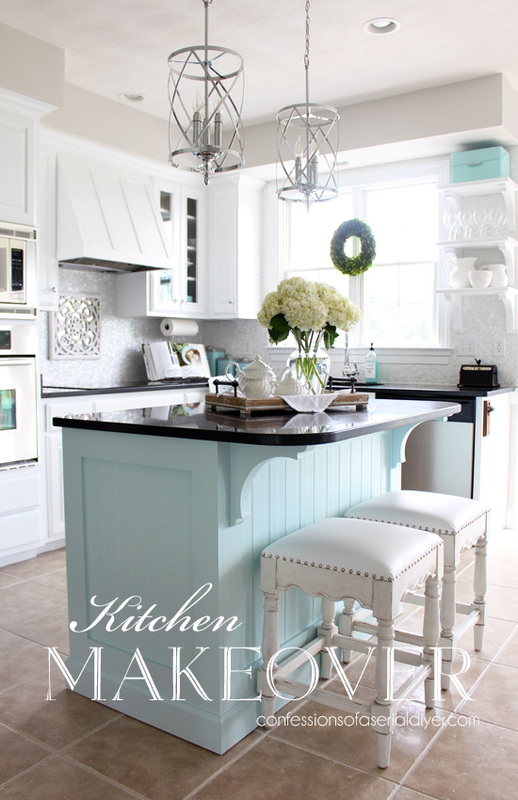 I used the exact same method as I shared in this How to Paint Kitchen Cabinets the RIGHT way tutorial. I shared that process with you HERE. 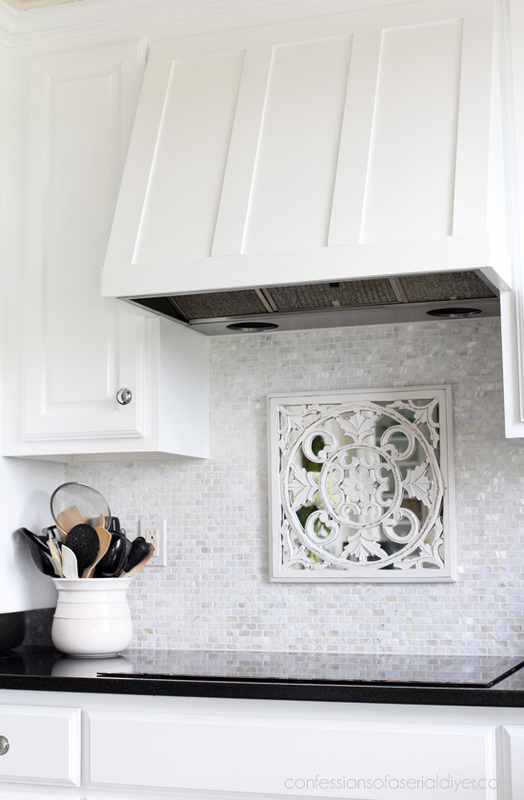 Revisit how I built this cover for our range hood HERE. It breaks up the cabinetry and adds a little something to that corner. I shared step-by step how to do this in our last kitchen in this post HERE. My Hubby switched out the old pendant lights with these gorgeous ones I found on Amazon HERE. They are so elegant and very reasonably priced! 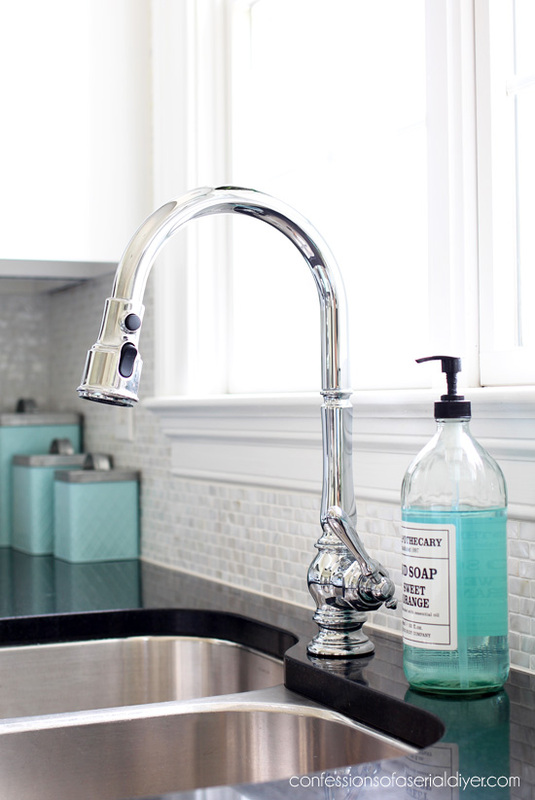 I absolutely love our new faucet! It has a pull-down sprayer that is so much more functional than our old one. Plus it has three different spray settings. And of course it is just pretty to look at as well. I also purchased this on Amazon HERE. The floors got a refresh with a good grout cleaning. 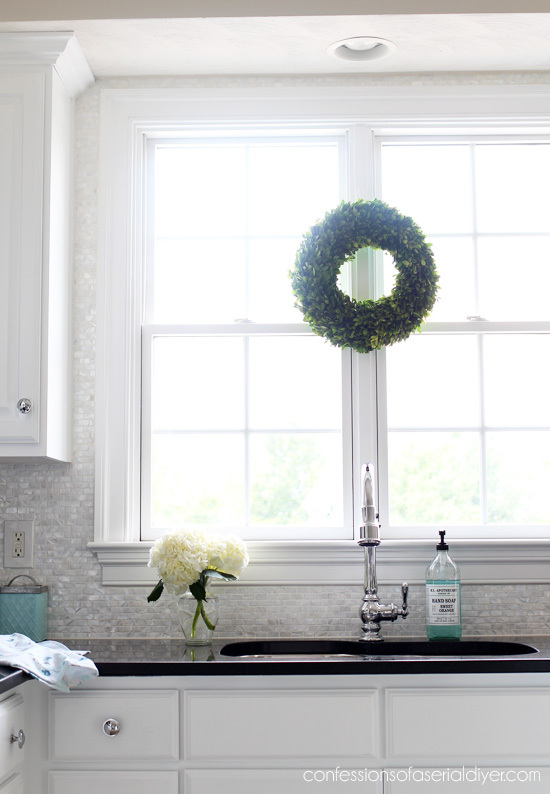 I used the same chemical-free method I used in our Guest bath Makeover HERE. It shimmers and sparkles and makes me happy just looking at it! I purchased this beautiful mother-of-pearl tile from Amazon HERE. I opted for a bright white grout. I’ll follow up soon with a how-to for the tile installation for anyone who might be interested. I am still undecided on window treatments for this window and we are actually enjoying it as is for the time being. I used the same brackets that I used on our kitchen island from the Home Depot. Luckily there are studs behind each bracket, so I was able to drill screws in between tiles and right into the studs to hang these. They don’t hold a ton, but they definitely hold more than the dinky cabinet that was there, and they will be fun to decorate seasonally. I am so thrilled this space is complete! It took us about five weeks from start to finish. 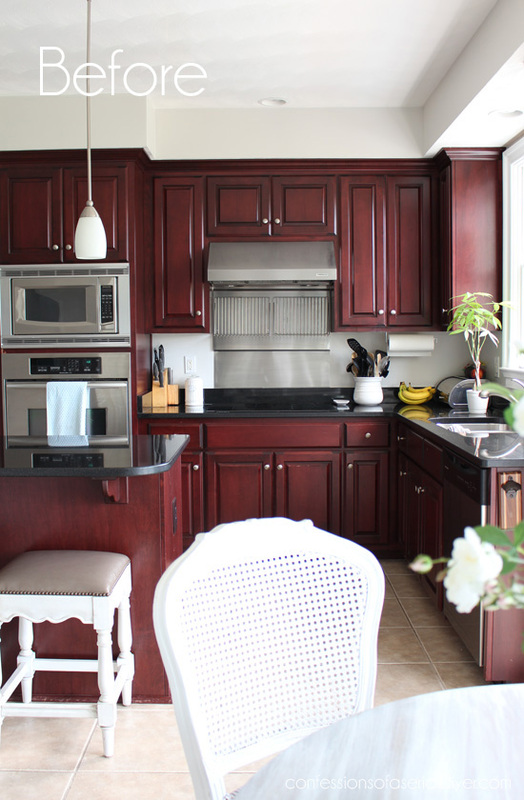 If you can salvage your existing cabinets and opt for painting them, the savings is huge. Now I haven’t tallied up all that we spent on this space, add I’m sure it was a good penny, but not nearly as much as it could have been had we replaced all the cabinets instead of painting them. This is what Brennan thinks of our new kitchen! I had painted the walls several months ago and I chose to use the same paint that is in the rest of our downstairs: Campfire Ash by Behr. It works so nicely with what we have going on in here. Our trash can used to sit out on the end of the island facing the dishwasher because that was really the only spot for it, and when the dishwasher was open, you couldn’t get by on that side. This was a great solution and I love that it’s out of sight. 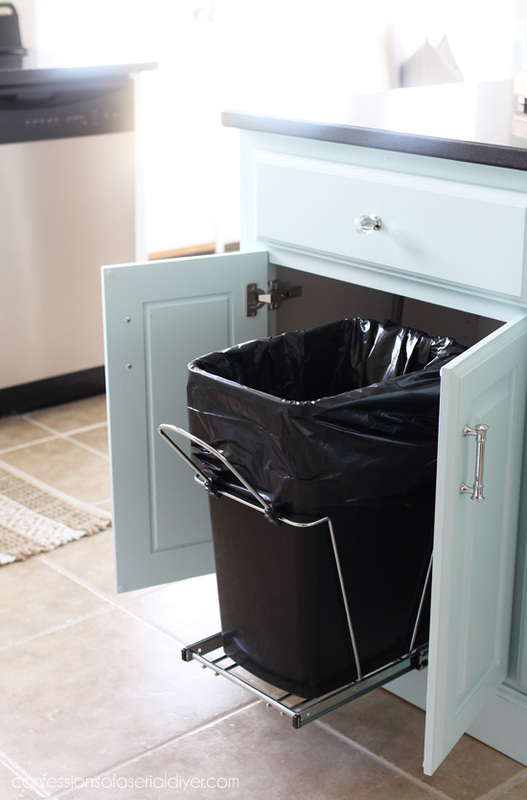 I found this pull-out trash can with hardware on Amazon HERE. And that’s our big kitchen reveal! I couldn’t be happier with the finished space! I hope ya’ll love it as much as I do. Thank you so much for your encouragement every step of the way! WOW, I love it! What a transformation! I just bet you don’t mind cooking in there so much now. You are amazing and oh so talented. 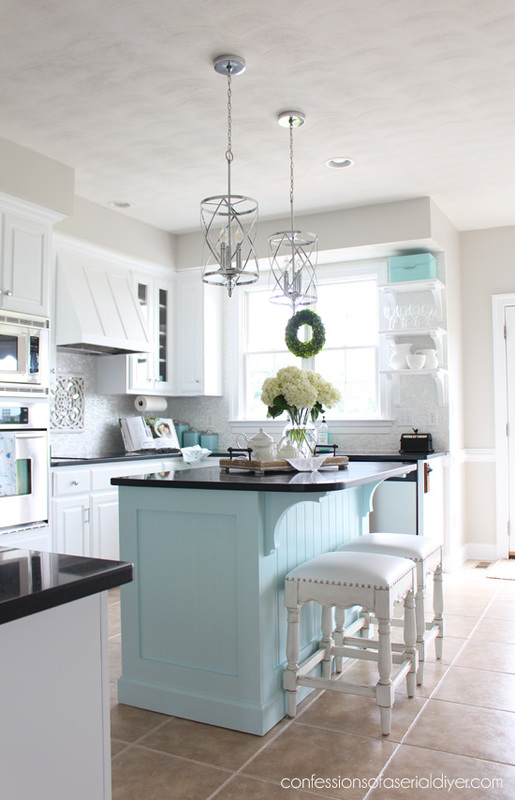 What a great way to have a “NEW” kitchen without the hefty price tag, good job! Now would you relax for five minutes-LOL!! 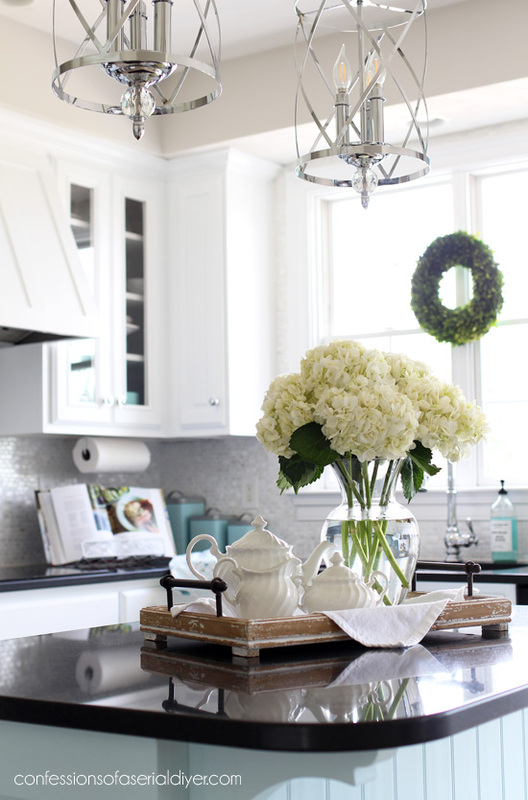 Your kitchen is so beautifu, I love how bright and airy it is! 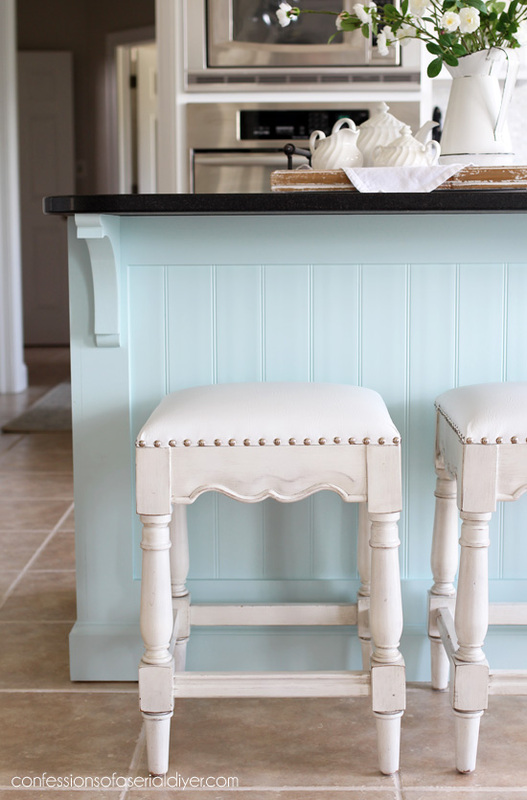 Can you tell me what color of paint you used on the kitchen island you used? I’d love to use this color for my island too. Beautiful!! Worth all the time and effort you put into it! you must feel so great when you walk in…do you pass by and turn on the lights and just look with a huge smile and a sense of accomplishment? Well you should because it is just gorgeous! 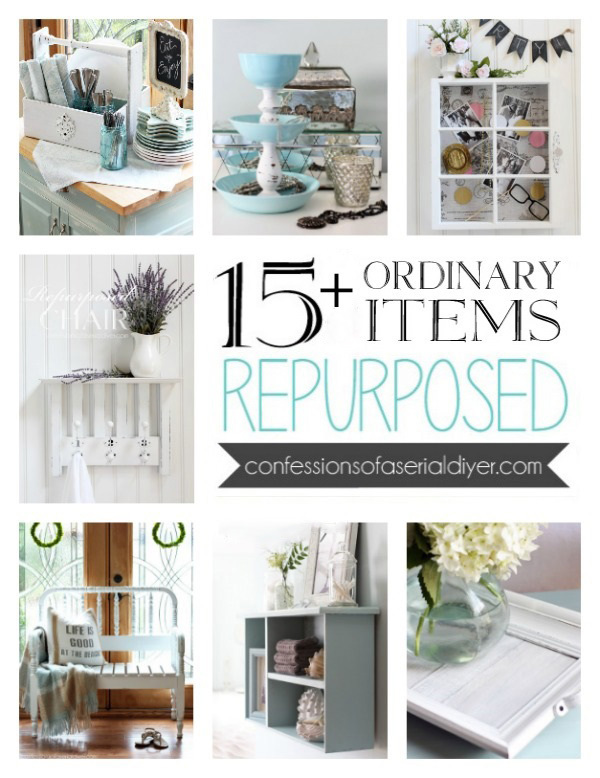 I luv the shelves…you did good by removing that cabinet. Am I seeing correctly, the left side near stove top isn’t tiled and is that a piece of the old 4” backsplash remaining? Need to know why! Bravo!! It looks awesome, Christy!!! Beautiful Kitchen…. I know that you love the outcome ! 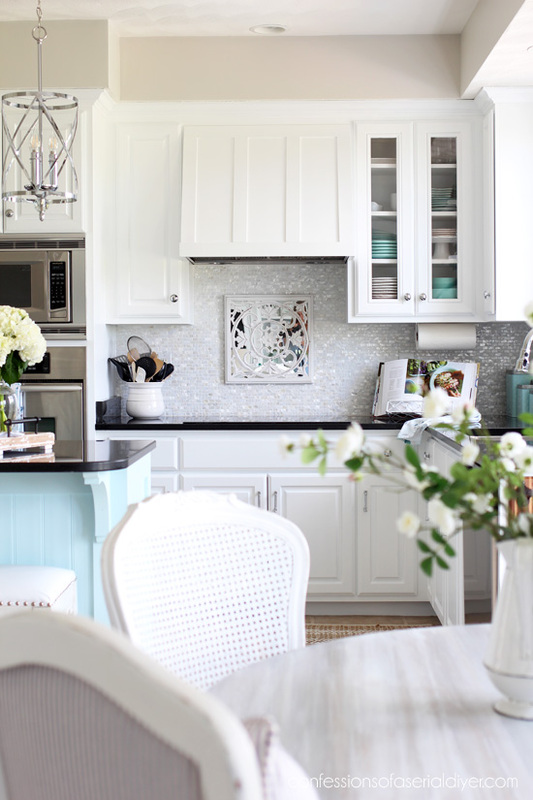 Your kitchen is absolutely beautiful and inspirational! The kitchen is beautiful. Love the light airy space. As usual, you’ve done a fabulous job. WOO HOOO ! ! ! 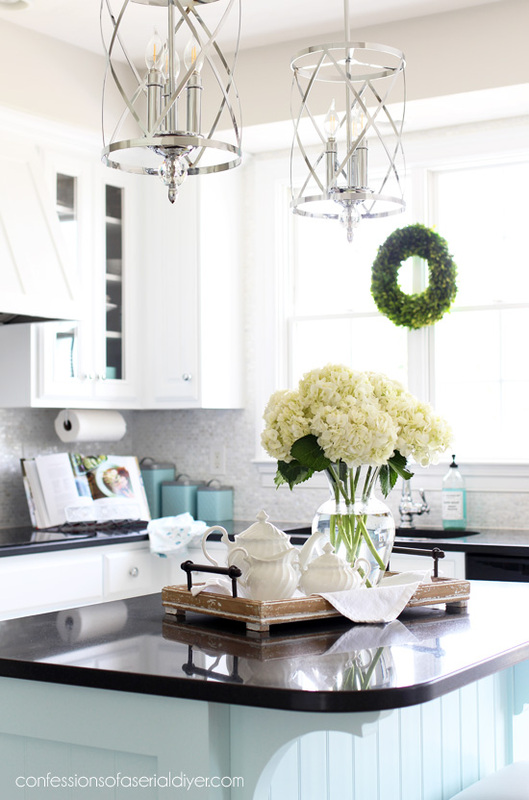 Christy, ya’ll did a GREAT job and your kitchen looks absolutely resplendent! I am thrilled with and for you. It was a LOT of work and I hope you enjoy it for many years to come! Your kitchen is just beautiful. You should be so very proud of your work. Enjoy looking at it every day! 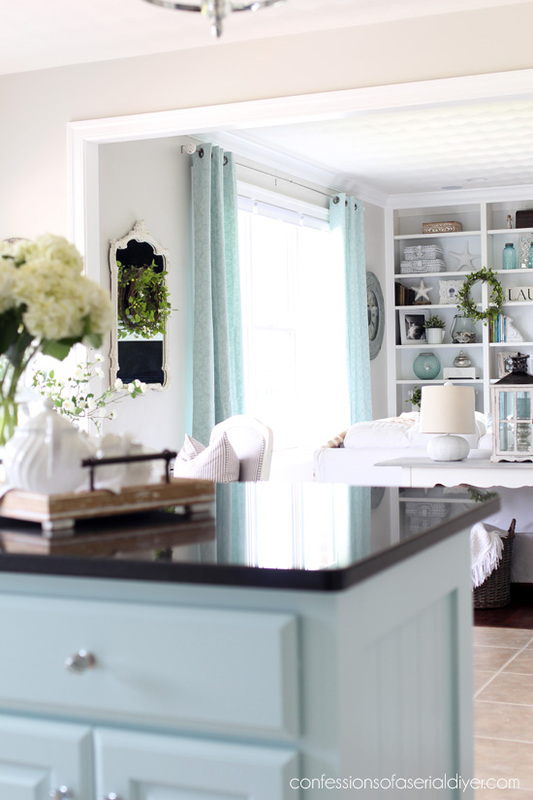 This is a very special kitchen makeover. Wishing you so much happiness enjoying your new happy space! Thank you for sharing your transformation with us. All I can say is, “Stunning!” Just a beautiful makeover, and an inspiration for those of us who are going to try the same job! Keep up the good work!! Canada is loving you! So lovely, Christy! All that hard work really paid off. I had my doubts about the open shelves, but they add such a nice accent on that side. The family is going to enjoy this space for a long time. Awesome job Christy! It turned out beautifully. It has just the right amount of color and looks so fresh and clean. Thanks so much for taking us on your kitchen journey and sharing the process. I love your style and look forward to your posts every week! Congratulations, you did a beautiful job! I’m sure you just love being in there. It’s so bright and calm. Hope you have many years of enjoyment and memories with your family in it. Absolutely lovely! It is amazing what you have achieved. I’m sure your entire family will enjoy your new kitchen. Thanks for sharing. Having painted cabinets in two kitchens and four bathrooms over the last 4 years , I know how much time and effort is involved. This is a great job and I can not tell you how much I love that tile!!! I have no idea how you got it done in such a short time. 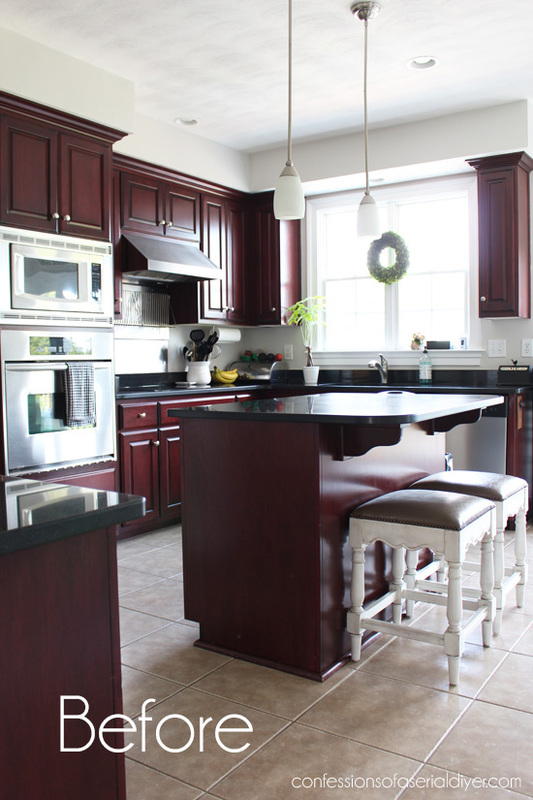 Your kitchen looks amazing, Christy, what a difference! 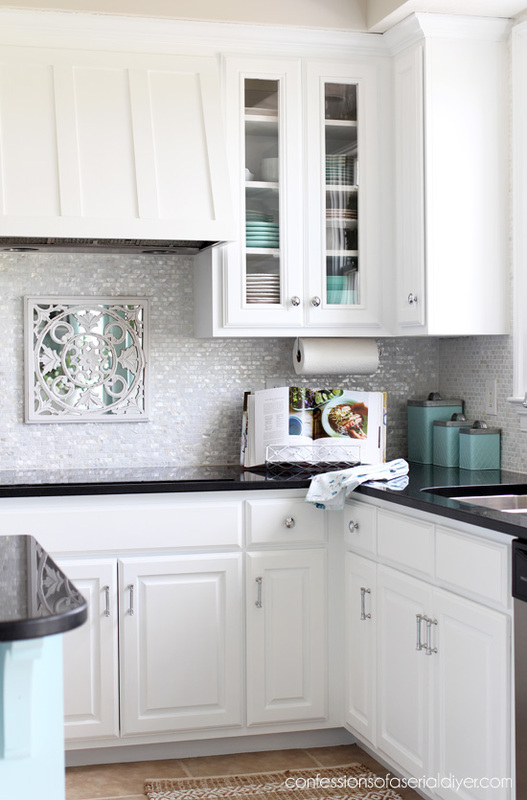 The backsplash is gorgeous and love the pops of blue and chrome in the room. Pinned to my Kitchen board. The kitchen is absolutely gorgeous! 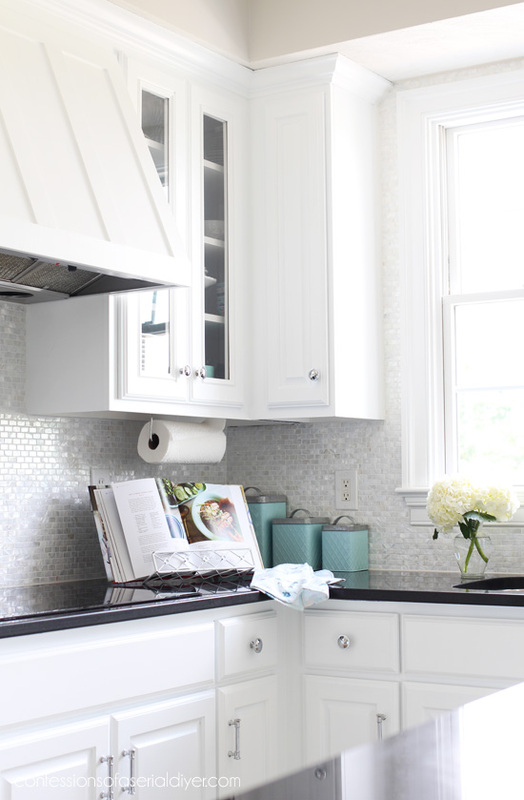 The back splash is the jewel in the whole makeover. Love the new pendants (among other details). it is spectacular! what a great job! loving the coastal feel! So breath taking! 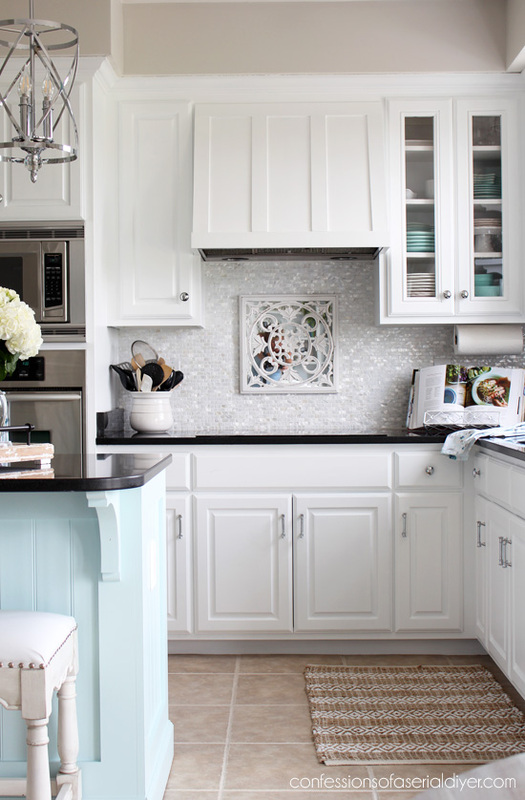 Your kitchen looks so amazing and that mother of pearl tile is so unique and beautiful. 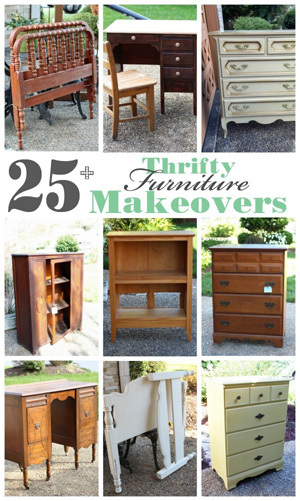 Great makeover Christy! It’s so “you”. It’s absolutely lovely. Great job!! So beautiful! A breath of fresh air!! I need to clean my grout as well, and would like to know which grout sealer you used. Thank-you. Thank you, Catherine!! I have yet to seal the grout, but I have had to wipe up a couple of spills since I cleaned it, and they came up really easily. So now I wonder if I really need to seal the grout if it cleans up so easily? Abso-bloomin’-lutely BEAUTIFUL. I don’t even know what else to say! Christy, this is GORGEOUS!!! Perfection… and in FIVE weeks?!? Does anyone else think that some talents are distributed unfairly?!? Haha! No, really, I know you worked to get to this skill level. Well done. Just beautiful!! 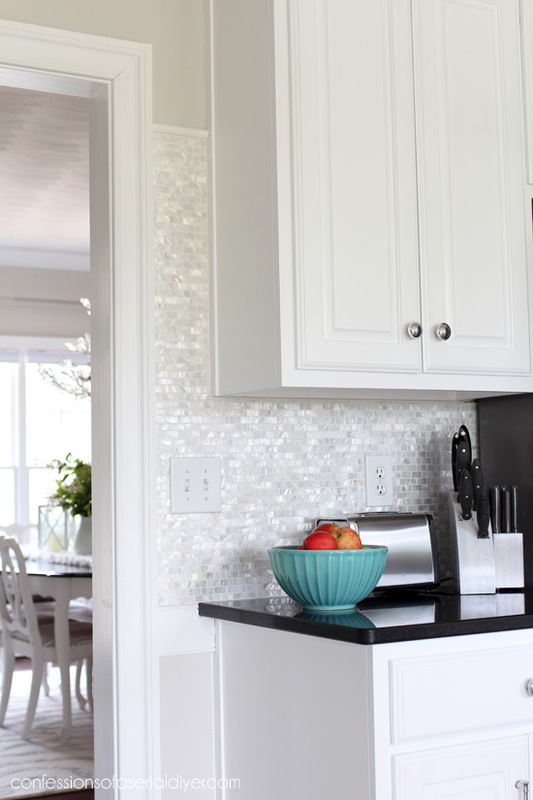 All of your choices were spot on, from the sparkling back splash to the pendants! Every ounce of work paid off! 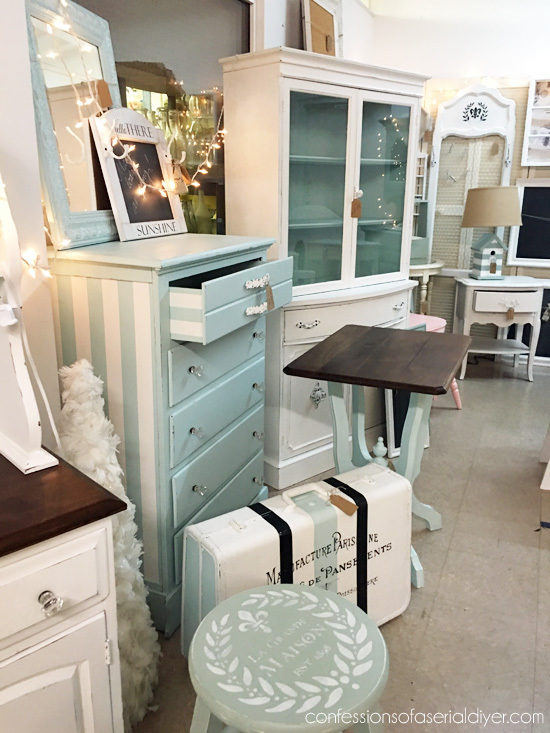 It has the coastal vibe you love, blending so nicely with the rest of your gorgeous home. 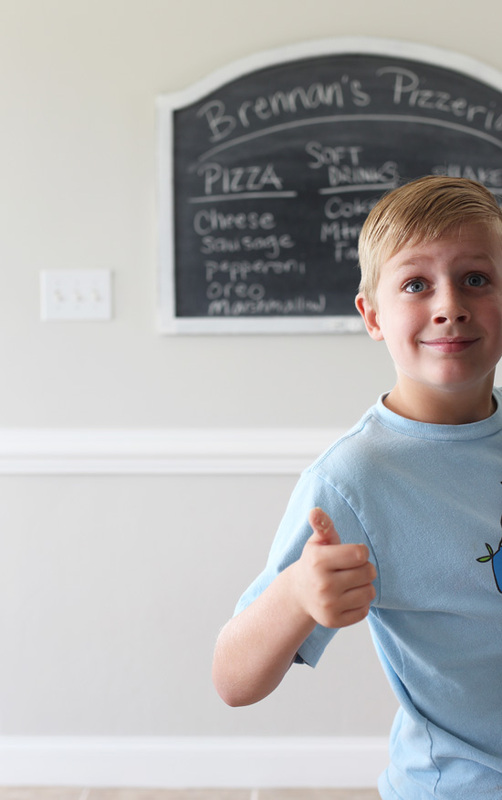 You are an inspiration to all of us DIYers out there! You and your husband make a great team. Thank you for sharing all your projects with us which transformed your stunning kitchen! Be blessed enjoying your new space! It’s absolutely beautiful!!!! Great job. Omg Christy! I have followed you for some time now and I am in awe of your kitchen remodel. Your vision and talent are really quite amazing and whatever it cost to do, it was worth every penny. You have inspired me to paint my existing cabinets and given me some great ideas of things to try myself. 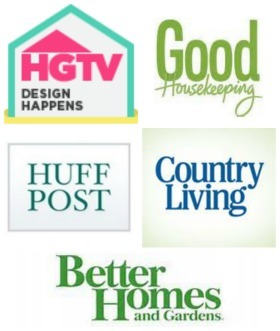 Thanks for all the “how to” links I am studying them as we speak. Enjoy that amazing new space. I rarely use the word love, but this reveal is lovely and I do love it. Leave the mirror over the stove! Perfect. Thank you so much for letting us in. Oh man! Im salivating. Your kitchen looks gorgeous! I’m so impressed with your carpentry skills. I love how the shelves turned out. 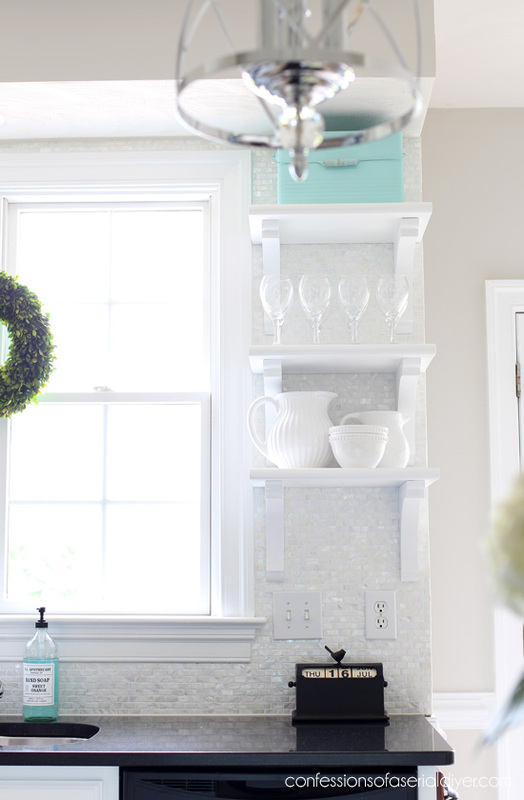 You have both the ability to visualize and to actually do the work of decorating. What a gift! Love it! Christy, it is beautiful! I love everything about it. You are amazing at how fast you get things done. I wish I could do things that fast. Although I did finally get my son to pull out the old TV from the cabinet. I was able to put the legs on it and it is in my kitchen. You can see it on my Thursday blog. I move to just once a week for the summer because of babysitting my grandkids. Now I just have to work on getting the inside of the cabinet set up and the top finished and I will be able to paint it. Wow, I follow you and see all your work but don’t usually comment. However, this kitchen is stunning! What good work. And your boy is so beautiful! Ladies watch out when he gets older. It’s lovely just everything is lovely fresh and updated. Should be featured in a magazine before and after!! Simply beautiful!! and your son is adorable too! Your kitchen is simply beautiful!! Love the colors and decor. Congrats!! Christy you are the Bomb.Com. Your kitchen turned out amazing!!!. It speaks your style from top to bottom. I love the idea of saving what you could and not getting rid of perfectly good materials like the floor,cabinets,what a $ savings. Honestly, I didn’t expect any less from you. You always do a Beautiful job!! Thanks so much for letting us come along on this ride and for teaching us sooooo much. BTW, did you make that cute tray on island top, if so, somehow I missed it. 💕 your work. So much better than before! 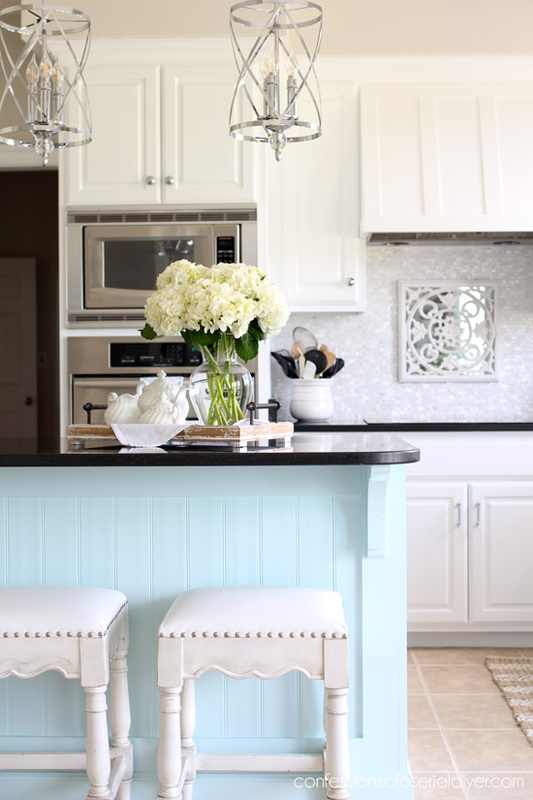 My favorite things are the pendant lights over the island and the gorgeous shimmery backsplash. I also love the rug at the kitchen sink. Where’d you get that, btw? Thanks for sharing all your hard work. It really paid off and looks fabulous!! 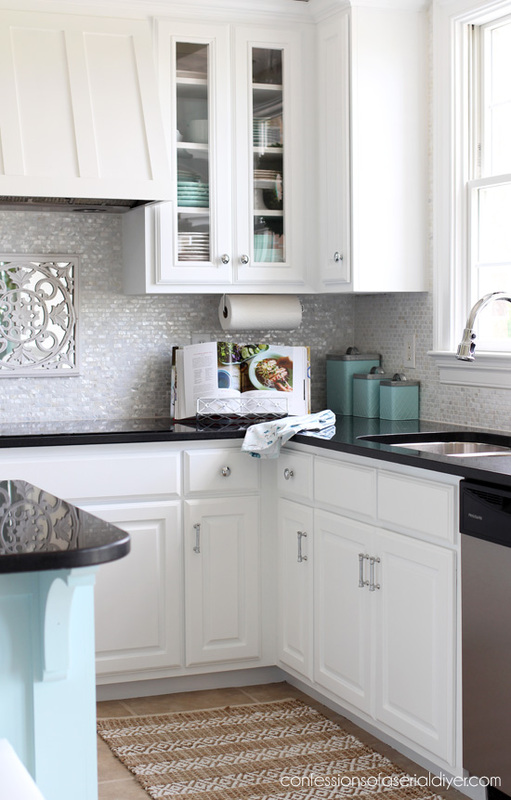 Your kitchen makeover is spectacular. I like white kitchens too. 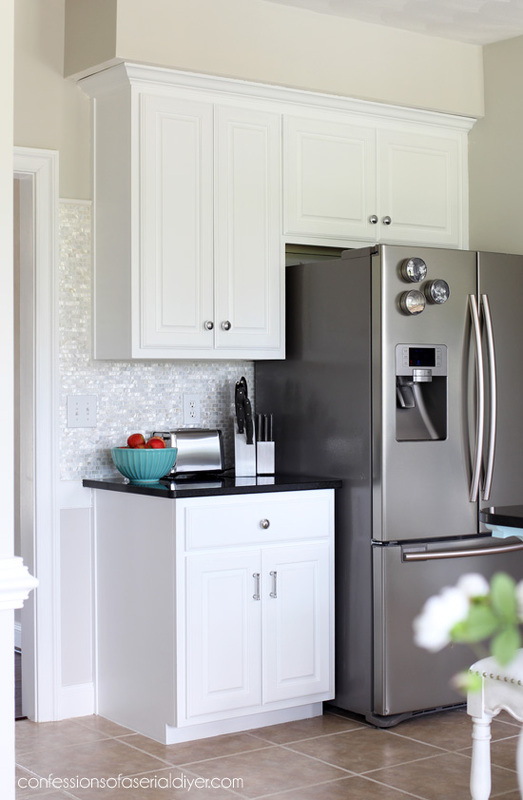 You saved a lot of money in painting your existing cabinets…and who doesn’t like to save money! I absolutely love it! Soooo much better. It looks so clean & bright. GREAT work! Love it!!! Every. Single. Bit!!! Great decision on the open shelves. It’s balanced , functional, versatile and unique. Much better than dinky cabinet! 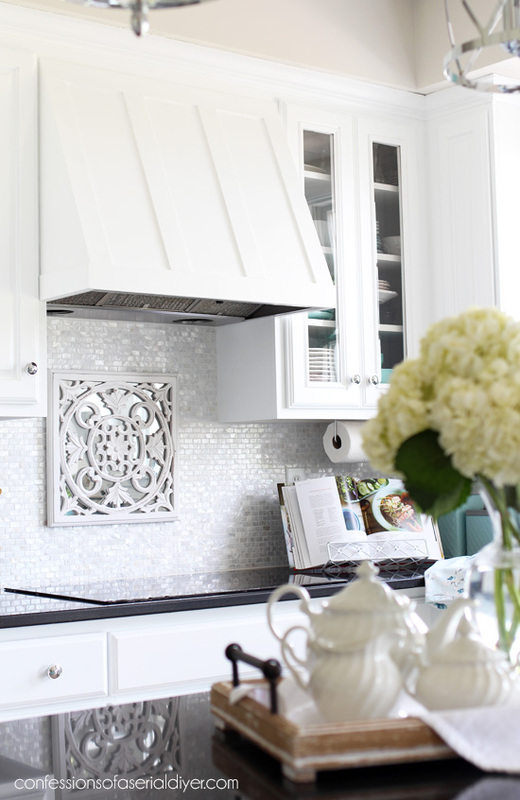 And that backsplash tile..it is the perfect “jewelry” for your “outfit”. Thank you for sharing your kitchen reno along the way. It is really exciting to see the finale! All your hard work sure payed off. It’s beautiful. Great job. It looks so great! 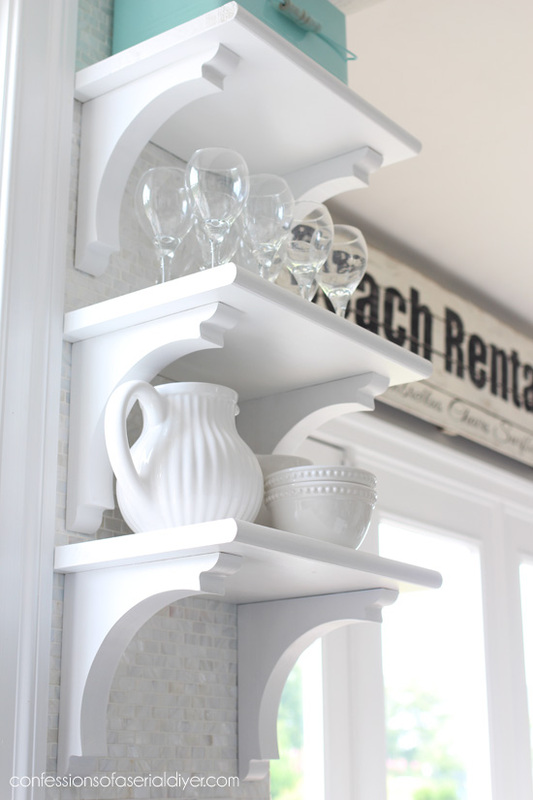 My boyfriend wants me to help him redo his beachside cottage and we are thinking of painting the cabinets. Gorgeous! I love how this turned out! You really are amazing! Fabulous job! Take a bow! 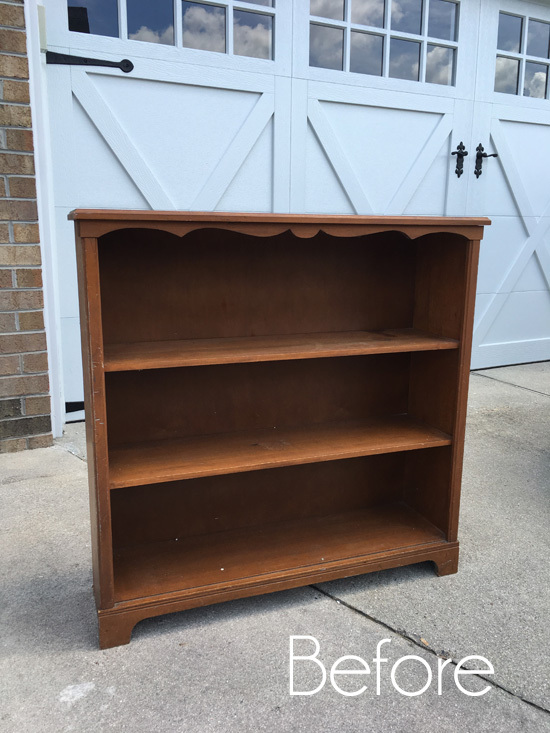 Love the shelves where the skinny cabinet was. Love the mirror over the stove. 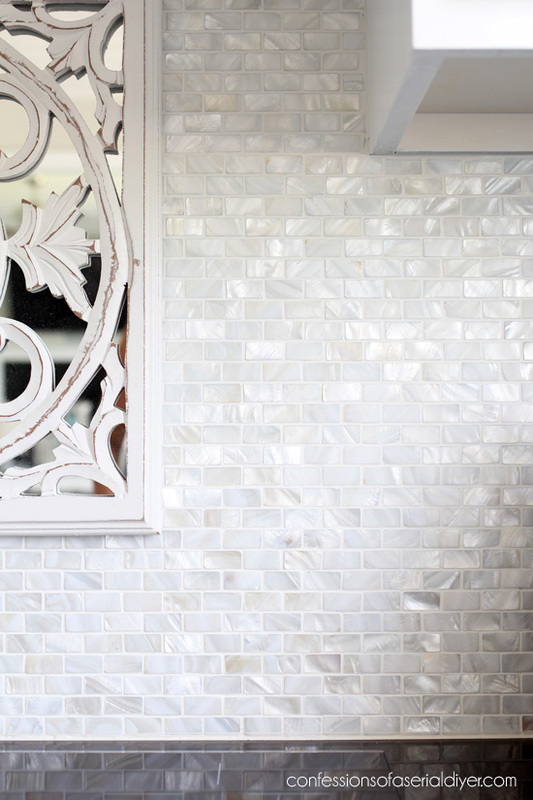 I once mirror tiled the entire back splash in my skinny galley kitchen so I could keep an eye on my 4 kids at the table and I love how it opened the entire dark “alley” up. I happen to love the window as is, as the eye is drawn to the wreathe and on out the window creating more space. Curtains would stop the eye. There are so many other beautiful things to view, the light fixtures, back splash, the island etc. You did a terrific job in a short time. Give that husband a big hug for all his help and patience. Your vision came to life. Beautiful job Christy. You inspire me with your goal setting and determined follow-through! And you still had time to go yard saling! Awesome! Christy, I love your kitchen, especially the blue island. I want to paint my cabinets white but my window above the sink is oak, as is the trim. My entire house had oak trim. How would you work around this one area? Wowsers!!!! We love it!!!! Love every single thing about it!!!! Good Job!!! Absolutely stunning & the back splash ❤️❤️❤️.You deserve a long spa day. It’s so light & bright it has to put you in a good mood just to walk in there! If Iived close I might show up on your door step for coffee 😂😂I would bring cookies for those cute boys. Christy — Absolutely gorgeous. Everything is tied together so perfectly. Your backsplash is amazing. Thank you for sharing your progress. I truly enjoyed each installment. Beautiful! And only 5 weeks, wow! Lovely! Everything is so fresh and crisp. The windows are to beautiful to cover with anything. I can see a hummingbird feeder hanging in front of the windows for you to enjoy. Your color choices are so calming and I know it must be wonderful walking into such a special place each morning. Congratulations on a great finish! It is beautiful and I am jealous! Just love everything you have done. Love, love, love your new kitchen! And all of this is just 5 weeks, amazing!!! You are so gifted in all you do! The island is gorgeous! I’ll bet your husband loves it now and sees the connection with the rest of the house. Enjoy that very lovely kitchen! Very nice – love the colors! WOW! It is gorgeous. So bright and airy. You did an amazing job. Thanks for sharing. Your kitchen is absolutely beautiful! I’m envious…mostly bc you’ve finished yours! Haha. I’ve been wanting to repaint my cabinets for 2 years now, but have put it off bc I remember how much work it was the first time! Also bc I can’t seem to figure out why some of my cabinet doors won’t close all the way. When we bought this house I painted the cabinets, changed the hardware, incl hinges and they’ve never closed properly since. I had hoped to switch to hidden Euro hinges, but they won’t work on our cabinets. You’re very skilled – any suggestions? This is so stunning!! You did an amazing job 😍 What color of white did you use for the cabinets? We’re gearing up to paint our cabinets white and choosing between shades of white is not my idea of fun 😂 would you recommend using the same white we have on the trim throughout our home? Perfectly perfect and perfectly gorgeous! Well done! Seriously gorgeous! Those five weeks flew (for me!) I love how well you document and explain everything! Amazing transformation! All your hard work has paid off. You should be very proud of yourself! Gorgeous! Christy, I have been following you for a short time now and absolutely adore everything you do!! You are my go to for inspiration! I do the same kind of thing you do (i.e. sell in a local shop) with the occasional show tucked in. My colors and the coastal dash are very similar (yet new to me, I mean the coastal part). We moved to Florida 3 years ago now from Minnesota so it’s still new to me. The market is so different that I have had to make MANY adjustments. 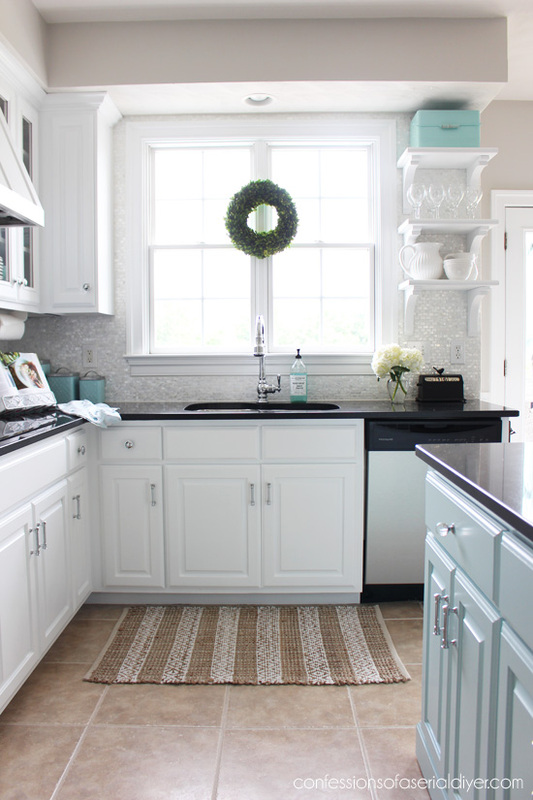 But back to your awesomeness, your kitchen redo is fabulous!! A lot of hard work but so worth the outcome! 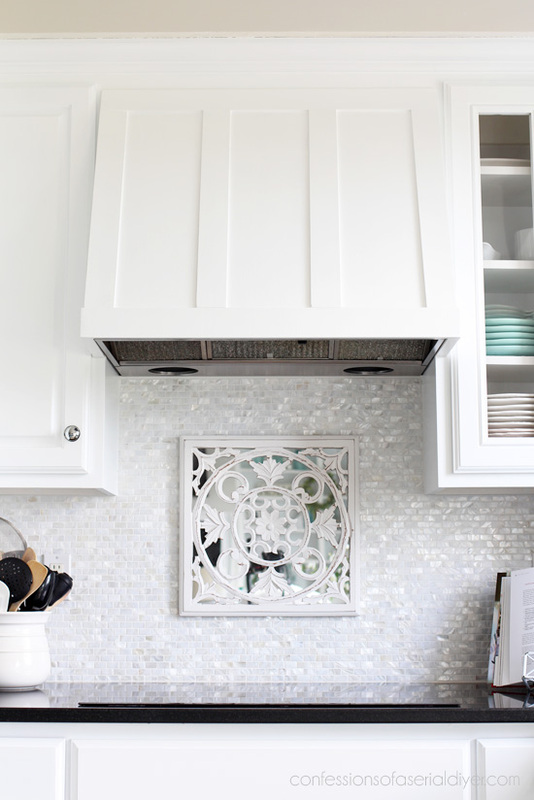 I almost had a fit when you put in the mother of pearl backsplash!!! It is so beautiful! I had an idea not long ago to purchase some similar mother of pearl tile from Amazon that I used in the back of a cabinet and on a lampshade. The both turned out so beautifully. I am looking for more ways to love it as well. So keep up the beautiful work and thank you so much for all the inspiration you share with us! Thank you, thank you, THANK YOU! All my best to you and your lovely family! Stunning, Christy!! I’ve said it before and I’ll say it again…I love absolutely everything you do! You are such an inspiration!! Woo hoo! Doing a happy dance for you over here! Absolutely gorgeous! Every detail is perfect, friend! Congrats! Thank you for your response. Please come, check out my blog and give me if you have any advice for a new blogger like me. I am very inspired by you. You are so awesome, lady! Beautiful kitchen!! Where did you find your mirror? Amazing Island! Christy, you are super talented. 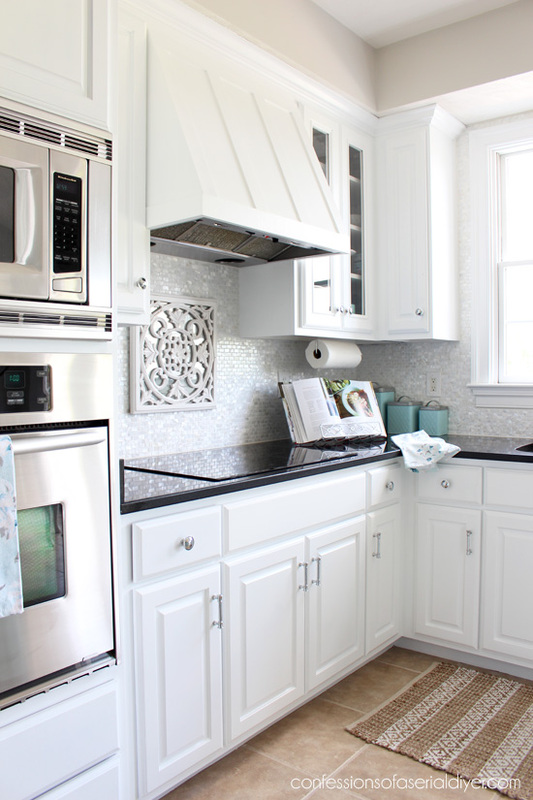 The cabinets and tiles are such a wonderful touch! I love the use of colors and the energy it gives off. How beautiful! Hi Christy – LOVE your website!!!! 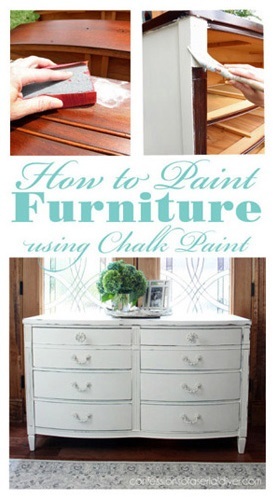 I’m also in the process of redoing my kitchen cabinets, and I used chalk paint. Do you have a recommendation for a sealer? Would you still recommend the Dixie Bell Satin Sealer? Thanks!!! Thank you, Cindy!! Did you paint your cabinets white? That sounds perfect – Thank You!! !